Tonight's red post collection includes a heads up that the Gromp summoner icon is now available for 250 RP, a collection of past login themes added to the LoL youtube page, Lyte on why team builder's level requirement has been increased to 25 from 20, and a special LCS edition of /ALL Chat! The new Gromp summoner icon is now available for purchase for 250 RP! "Okay, good news and bad news. We’ll start with the good news: we heard that a lot of you wanted more ways to customize your League experience with Summoner’s Rift icons, so we’re launching a few new designs to see if you dig them (maybe you saw the Baron icon already). Now for the bad news: it turns out pizza is still delicious but really bad for you. There’s a lot of imagery from Summoner’s Rift that could make for great icons, but with our latest, we went with one of SR’s newer jungle camps: it’s cranky, loves mushrooms, and often eats small insects (and junglers). That’s right: Gromp. From tiny toad transformed to toxic toad, Gromp represents a lot of the things that make SR’s jungle a strange and dangerous place. With the new icon, we focused on what makes Gromp Gromp and, at the same time, a unique representative of the jungle and a fierce enemy to those brave enough to traverse it. Gromp, unlike your typical toad, sports a triangular, pointed snout, giving the monster a more aggressive look to match the aggro attitude (you’d be mad, too if you were mutated by mushrooms). Gromp’s round, puffed out throat, on the other hand, emphasizes the fact that the monster is a tanky protector. This mixture of aggressive defensiveness is something that makes Gromp a unique creature in an equally unique atmosphere. 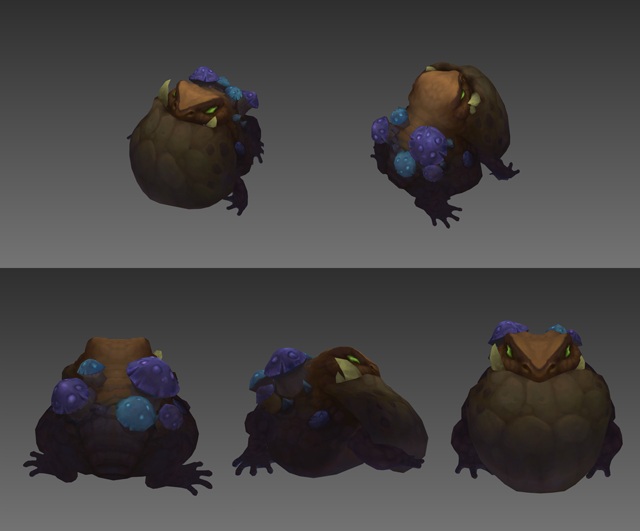 Another aspect that made Gromp a solid fit in our mind for this icon was sense of mystery surrounding the toad. Not much is known about Gromp, except for his transformation story: a little toad (perhaps tired of being a little toad) hops onto a magic mushroom and *WHOOSH BANG* becomes Gromp, toxic jungle creature and friend to none. Gromp’s strange origin, much like the magic coursing through SR, is a staple of the jungle and everything stalking its arcane terrain. Sure, Gromp’s not the king of the jungle, but the toxic toad holds down his mushroomed patch of SR with pride and extreme prejudice. We hope you like your new icon, Gromp… seriously, please don’t eat us. Grab the Gromp icon for 250 RP in the League of Legends store now and declare to the world that you can’t spell “jungle” without Gromp… wait, uh...nevermind." Find your favorite past login screens! If you've been hankering for a place to check out the older login screens, Riot has uploaded over 60 to the League of Legends youtube channel. "While doing a little spring cleaning on the LoL YouTube channel, our login screen artists threw a bunch of their past creations into a League of Legends login screen playlist that we thought we’d share with you guys! Dating back to Hecarim’s login from 2012, you can find almost sixty login screens for champions, skins, and even a couple events. Check it out if you ever feel like reliving your past favorites!" The full playlist contains (at the moment) 62 login screens! 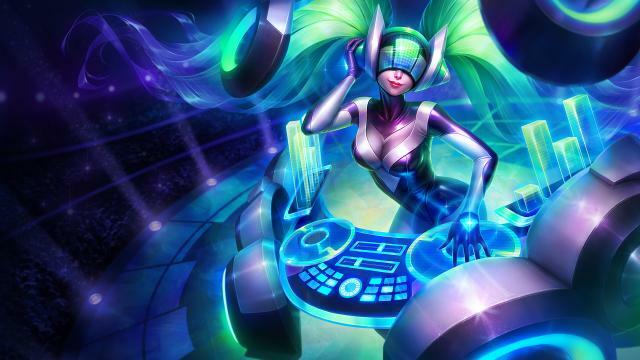 If you'd like to DOWNLOAD the music from these login themes, check out the LoL soundcloud! With the LCS Summer split starting up later this week, the /ALL Chat team is back with a special edition LCS party episode! "The NA LCS is coming back soon! A few weeks ago, ALL Chat went to the NA Spring Split finals to talk to players, watch Cloud 9 and TSM battle it out, and give you a feeling for what it’s like when so many League fans come out and celebrate together. Tell us what you think, and let us know in the comments where you want to see ALL Chat go next!" In April 2014, we ran a low level Team Builder experiment where we only had Team Builder available for lower levels, and then turned off most of the other queues. We learned a lot from this experience including how players would react if they "only" had a Team Builder-like experience to play. However, we ended the experiment around April 27th, 2014 and moved Team Builder back to Level 25 because we wanted to make some fundamental changes to Team Builder's design (like just having players choose Positions, not Positions + Role + Champions) and the matchmaking (how we distributed experience of players in a low level game because veteran friends tend to frequently play with their newbie friends). We also had a few design improvements to avoid new players getting trapped in weird combinations like "Taric Marksman" because they read the description of Taric and felt that it was appropriate, but then ended up being rejected from lots of teams. We found out that some servers (like NA) had their Team Builder levels reset to low levels again, and left it that way for a bit longer to continue collecting some data to inform the new Team Builder Draft design. We're confident in the new Team Builder design now, and believe it's a great experience even for low level players that can replace some of the low level experiences and really help players onboard into the League experience. So to avoid players falling into some of the traps in Team Builder "Classic" that I mentioned above, we're going to keep it at Level 25 until we can roll out the new Team Builder design. I know this might not be a popular decision in the short-term, but we're looking forward to having new players experience the new Team Builder design, and would rather them "level" up in League playing Normal Blind Pick for now because the queue times are just much quicker, and match quality is a bit better."